The voice unit (VU) meter is a device that displays a representation of the signal level in audio equipment. It is used in some consumer audio equipment for utilitarian purposes such as in recording devices or for aesthetics like playback devices. The original VU meter is a passive electromechanical device, but using a few LEDs with a controller and some lines of code, you will be able to make an interesting digital VU meter device. 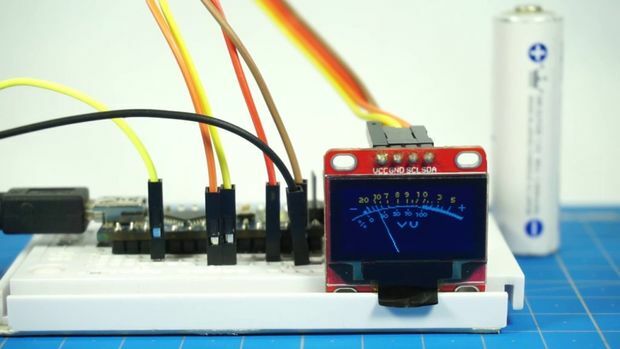 These two instructables (1, 2) present an easy way to build a VU meter using an Arduino. In the first one the sound signals are received from an audio jack connected with a mobile phone or MP3 player, and the output is displayed on a 10-LED row. The second is an enhanced version of the meter, the signals will be collected via a microphone, and the LEDs row is replaced with a LED logo to visualize the VU meter output. Veroboard and soldering equipment are required if you want to make your own LED design. First, design your LED logo by sorting the LEDs on the veroboard. You can use VeroDes to simplify this, it is an easy-to-use design program for those wishing to design circuits on veroboard. Make your design, print it, and then do some soldering. Connect the LEDs with the digital pins from 2 to 13 with the 100 ohm resistors, and each resistor should be connected with a LED row. The digital pins will act as a positive voltage to the LEDs. Finally connect the microphone or the audio cable with the A0 pin as shown in the figure. 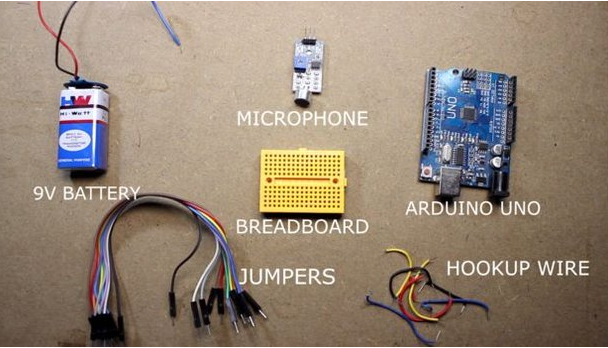 Now upload this Arduino sketch, power on the circuit, play music and enjoy the show. You may need to adjust the gain in microphone module to get the perfect result.